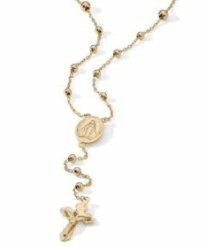 "My rosary-necklace is not only a valuable piece of jewelry but a sacramental that is valuable to my soul as well"
A rosary style necklace that does not contain a full set of beads but has the look of a "rosary"
A Rosary-necklace is a stylish sacramental. By wearing a rosary style necklace, you can evangelize with the added benefit of wearing an elegant and fashionable necklace. Feel the comfort of Jesus' love. Your Rosary-necklace will remind you of how much Jesus loves you. He loves you so much He became man and entered this world as a baby. He suffered and died so that you could become an heir to Heaven. It is indeed comforting to remember that there is a God and that He loves you very much. It is important to be careful with Rosary necklaces however. The use of this sacramental has been openly used by celebrities and now everyday people in a blasphemous and sacrilegious way. This is very offensive to the Blessed Mother. 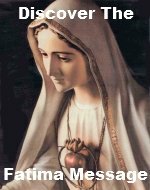 She came to Fatima to ask us to devoutly pray the Rosary everyday for peace and for the conversion of sinners. Rosary-necklaces should not be worn as a mere fashion statement and pagan symbols must never be worn. It is a mockery of what the Rosary symbolizes. If you are considering purchasing a rosary necklace, please be sure your motives are in the right place. Ask yourself, "Why do I want to wear a rosary necklace?" Your answer to that question will help you identify your motives. Remember it is a sacramental and you should treat it as such. Also be sure you are purchasing a Catholic rosary necklace. Never wear one that does not contain a crucifix (a Catholic medal like a Miraculous Medal is okay though). Ones with other symbols are not Catholic and should never be worn. 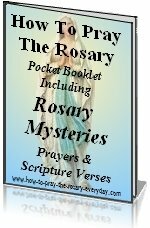 Here is an overview of rosary necklaces and the various materials in which they are made. Click on the link to learn more about the variety that interests you. Shop for rosary jewelry the same way you would shop for any jewelry. If you are looking for high quality jewelry made from precious metals or gems, purchase it from a well known jeweler. If you are shopping for less expensive varieties, you still should buy the highest quality available in that material. This will ensure that your rosary bracelet will be well made and be sturdy enough for daily wear. Be sure to check out the selection on eBay first. You can find high quality jewelry for a fraction of the retail price on eBay . Just make sure the seller has good feedback. See our Auction Tips page for more information about bidding on an auction.